Gite with Private Garden and Pool with Stunning Views, don't delay, book today! Property 4: Gite with Private Garden and Pool with Stunning Views, don't delay, book today! Detached house with terrace, gd land, quiet. Property 11: Detached house with terrace, gd land, quiet. Large independent studio. Superb peaceful setting, stunning views. Property 15: Large independent studio. Superb peaceful setting, stunning views. Beautiful house ... next village! garden! Property 18: Beautiful house ... next village! garden! Peaceful Dordogne location, nature lovers paradise. 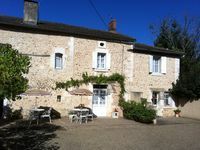 Property 20: Peaceful Dordogne location, nature lovers paradise. Comfortable and pretty two rooms in quiet and historic area. Property 23: Comfortable and pretty two rooms in quiet and historic area. Holiday home in Périgord, a green and quiet. Property 27: Holiday home in Périgord, a green and quiet. Charming hamlet in the gates of the Perigord Noir and the castles. Property 43: Charming hamlet in the gates of the Perigord Noir and the castles. We had a wonderful stay. Our host was so helpful in providing everything we needed. The apartment was large and very comfortable. It was close to the train station and a short walk to the old part of town. Just the right size,wonderful connection between indoor and outdoor space. Convenient to Vergt. Well equipped.